Summerfield, in Munich’s Hof Quarter, is the first port of call for high-end outdoor ambience. Lakeside residents find all they need here to stylise their homes with both elegance and comfort. For many years now, Summerfield has been the face of exclusive outdoor living in the Hof Quarter. With the highest quality furniture by MBM, Queen’s Garden and Glatz and not to mention the largest Resysta Showroom in Europe. Summerfield presents the broadest spectrum for „outdoor living“ – a myriad of combinations between traditional and contemporary, high-tech and pure class. Ensembles hand-picked by managing director, Valeria Buyanover, and personal consultations help clients make the right choice, with the possibility for immediate delivery. 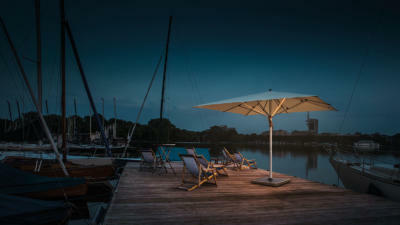 Ranging from high-tech rattan chairs, to stainless steel and innovative designs from Resysta. Extravagant shapes and new materials leave plenty of room for creativity and the courage to experiment. Resysta is a natural fibre compound, with the natural look and feel of wood, yet 100% water resistant. Almost all Resysta products are stocked by Summerfield.